I sent a response to Gen. McClernand’s letter. HEADQUARTERS DEPARTMENT OF THE TENNESSEE, Before Vicksburg, January 31, 1863. GENERAL: The intention of General Orders, Number 13., is that I will take direct command of the Mississippi River expedition, which necessarily limits your command to the Thirteenth Army Corps. In charging the Thirteenth Army Corps with garrisoning the WEST bank of the river, I add to it any forces belonging to any command on that bank not already assigned to other corps, and, instead of weakening your force in the field, it will strengthen it by about 7,000 men, still leaving a proper garrison at Helena, the only place I now deem necessary to garrison. All forces and posts garrisoned by the Thirteenth Army Corps are under your command, subject, of course, to directions from these headquarters. I regard the President as Commander-in-Chief of the Army, and will obey every order of his, but as yet I have seen no order to prevent my taking immediate command in the field, and since the dispatch referred to in your note, I have received another from the General-in-Chief of the Army, authorizing me directly to take command of this army. I at first thought I would publish no order taking command, but soon saw it would be much more convenient to issue orders direct to corps commanders whilst present with the command than through another commander. I have received the following letter from Gen. McClernand, reacting to my assumption of command. HEADQUARTERS ARMY OF THE Mississippi, DEPARTMENT OF THE TENNESSEE, Before Vicksburg, January 30, 1863. Major-General McClernand is directed to proceed to the States of Indiana, Illinois, and Iowa, to organize the troops remaining in those States, * * * and forward them * * * to Memphis, Cairo, or such other points as may hereafter be designated, * * * to the end that when a sufficient force not required by the operations of General Grant’s command [then in WEST Tennessee] shall be raised, an expedition may be organized under General McClernand’s command against Vicksburg and to clear the Mississippi to New Orleans. It is the wish of the President that General McClernand’s corps shall constitute a part of the river expedition, and that he shall have the immediate command, under your direction. I repeat that I respectfully ask for an explanation of this seeming conflict of authority and orders, that I may be enabled to guide my action intelligently. By [Special] Orders, Number 22., you extend your command as far WEST from the Mississippi River as your orders may reach. By General Orders, Number 13., you charge the Thirteenth Army Corps with garrisoning Helena and other points south. Is it to be understood that my command WEST of the Mississippi is so coextensive with the purview of Special Orders, Number 22? Again, you charge the Thirteenth Army Corps with garrisoning the WEST bank of the Mississippi. Am I to understand that I am to act on my own judgment in fixing the number, strength, and location of those garrisons, or simply by your directions? It is quite obvious that the whole or a large portion of the Thirteenth Army Corps must be absorbed by these garrisons if the purpose is to afford complete protection to all lawful vessels navigating the river; and having been by a series of orders assigned to the command of it, I may be entirely withdrawn from it. For the reason last stated, and because the portion of the Thirteenth Army Corps taking part in this expedition is very much smaller than any other corps of your command, and because my forces are here and those of others have yet to come, why not detach from the latter to garrison the river shore and relieve all those here from liability to that charge? Jan 31 1863. I have issued General Orders Number 13, announcing that I am taking command of the Vicksburg expedition. GENERAL ORDERS, Number 13. HDQRS. DEPT. OF THE TENNESSEE, In Field, Young’s Point, La., January 30, 1863. I. Major General U. S. Grant, commanding Department of the Tennessee, hereby assumes the immediate command of the expedition against Vicksburg, and department headquarters will hereafter be with the expedition. II. Army corps commanders will resume the immediate command of their respective corps, and will report to and receive orders direct from these headquarters. III. As army corps to be effective should be complete in their organization, and ready at all times for any move they may be called on to make, without looking to department or other headquarters for anything more than the replenishing of their supplies, no changes of transfers will be made by department orders, unless absolutely necessary for the interest of the service. IV. The Thirteenth Army Corps, Major General J. A. McClernand commanding, is charged with garrisoning the post of Helena, Ark., and any other point on the WEST bank of the river it may be necessary to hold south of that place. Send a stern wheel Steamer, with as many troops as it can conveniently carry, to the entrance of Yazoo Pass, for the purpose of cutting the levee and letting the water from the Mississippi in. The GunBoat by which is sent will accompany the expedition. The party should remain at the Pass until they see the work effectually done, and then return to Helena. I shall certainly not want Genl’ Fitch’s Brigade here for several days. Jan 29 1863. Arriving at Vicksburg, I gave an update to Gen. Halleck on the condition of the canal project. January 29, 1863-5 p. m.
Water in the canal is 5 feet deep, and river rising. There is no wash, however, and no signs of its enlarging. I will let the water in from the Yazoo up, and try the effect. I have ordered troops from Helena, escorted by a gunboat, the whole in charge of Colonel Wilson, topographical engineer, to cut the levee across Yazoo Pass, and to explore through to the Coldwater, if possible. We have just arrived here all safe and well, but being after dusk and the troops ashore will not learn anything of the situation of affairs until morning. If I find that I shall not go back to Memphis until the reduction of Vicksburg is attempted, I will write to you so that you can go and make the children a visit. The trip, with nothing to bother me, makes me feel well. The living on the boat is very fine and my appetite good. The Capt. and owner of the boat is Capt. Shinkle of Covington, Ky.
News just received from Vicksburg says water now in old canal, and rising rapidly. In a short time our batteries of Parrott guns will command the river below town. 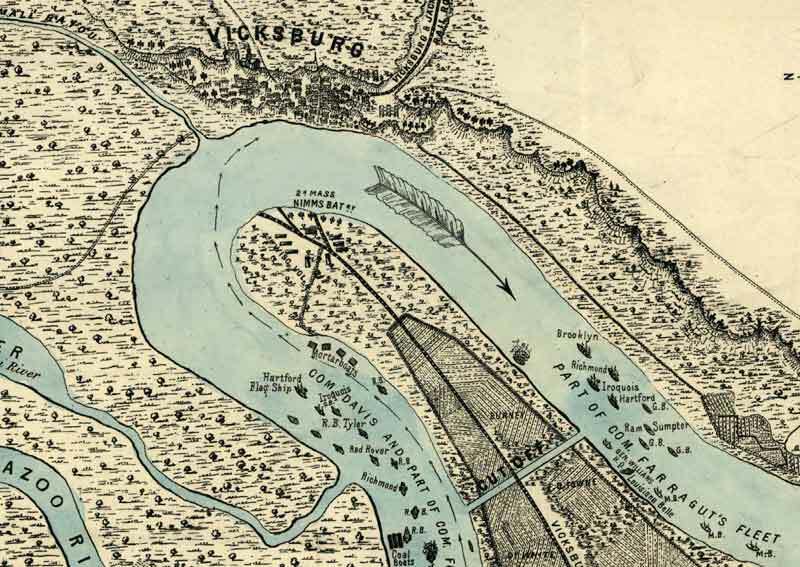 Vicksburg papers say that General Banks is fortifying Baton Rouge. I hold two divisions here ready to re-enforce the expedition as soon as wanted; also Gorman’s forces. I leave for the fleet at Vicksburg to-morrow. Since leaving there, one week ago, I have not had one word from them. The constant rains and tremendous rise in the river may operate against us for the time being. Jan 22 1863. I have received word that troops in Arkansas will be placed under my command. I wasted no time letting their commanders know that the expedition on Vicksburg is our top priority. WASHINGTON, D. C., January 21, 1863. By direction of the President, Major-General Grant will assume command of all troops in Arkansas which may be reach of his orders. The portion of Arkansas occupied by such troops will be temporarily attached to the Department of the Tennessee. In conformity with the above, I have attached your command to the Thirteenth Army Corps, Major-General McClernand commanding. I will have you furnished soon with all such past orders as are necessary for your guidance. I wish you to return to Helena with your command as soon as possible, and discharge all the steamers that can possibly be spared. Do not understand this as an order to abandon any enterprise for breaking up the enemy in his strongholds, if you are near the accomplishment of such a result. The Mississippi River enterprise must take precedence over all others, and any side move made must simply be to protect our flanks and rear. So long, however, as the enemy have steamers in the White and Arkansas Rivers, it is necessary for the safe navigation of the Mississippi to Vicksburg to break up all their forces on those two rivers, and, if possible, get possession of their boats. I will be going down the river in a few days, when I hope to meet you at Helena. I returned here last night from a visit to the expedition under General McClernand. I had a conversation with Admiral Porter, General McClernand, and General Sherman. The former and latter, who have had the best opportunity of studying the enemy’s positions and plans, agree that the work of reducing Vicksburg is one of time, and will require a large force at the final struggle. With what troops I have already designated from here, no more forces will be required for the present, but I will suggest whether it would not be well to know beforehand where they are to come from when required at all. The enemy have the bluffs from Haynes’ Bluff, on the Yazoo (this is where the raft across the river is constructed), to the Mississippi, and down until they recede from the river, completely and thoroughly fortified. I propose running a canal through, starting far enough above the old one commenced last summer to receive the stream where it impinges against the shore with the greatest velocity. The old canal left the river in an eddy, and in a line perpendicular to the stream, and also to the crest of the hills opposite, with a battery directed against the outlet. This new canal will debouch below the bluffs on the opposite side of the river, and give our gunboats a fair chance against any fortifications that may be placed to oppose them. But for the intolerable rains that we have had, and which have filled the swamps and bayous so that they cannot dry up again this winter, a landing might be effected at Milliken’s Bend, and roads constructed through to the Yazoo above the raft or Haynes’ Bluff, and the enemy’s works turned from that point. Once back of the intrenchments on the crest of the bluffs, the enemy would be compelled to come out and give us an open field fight, or submit to having all his communications cut and be left to starve out. I would make no suggestions unasked if you were here to see fof I did not know that as much of your time is taken up with each of several other departments as with this. As however, I control only the troops in a limited department, and can only draw re-enforcements from elsewhere by making application through Washington, and as a demonstration made upon any part of the old district of WEST Tennessee might force me to withdraw a large part of the force from the vicinity of Vicksburg, I would respectfully ask if it would not be policy to combine the four departments in the WEST under one commander. As I am the senior department commander in the WEST, I will state that I have no desire whatever for such combined command, but would prefer the command I now have to any other that can be given. I regard it as my duty to state that I found there was not sufficient confidence felt in General McClernand as a commander, either by the Army or Navy, to insure him success. Of course, all would co-operate to the best of their ability, but still with a distrust. This is a matter I made no inquiries about, but it was forced upon me. As it is my intention to command in person, unless otherwise directed, there is nospecial necessity of mentioning this matter; but I want you to know that others besides myself agree in the necessity of the course I had already determined upon pursuing. Admiral Porter told me that he had written freely to the Secretary of the Navy, with the request that what he said might be shown to the Secretary of War. General Gorman had gone up the White River with most of his forces, taking a great deal of the river transportation with him. I find great difficulty in getting boats to transport the troops. With the orders I gave, however, to release boats as fast as they can be dispensed with, I hope to remedy all difficulties of this kind.